Google is preparing to introduce a 4.3-inch display technology with 18MP resolution at the Display Week 2018 targetted specifically at VR headsets. According to a newly-published advanced program for the expo, Google will be showcasing a screen with a wide field-of-view, 1443ppi pixel density and OLED display technology. The presentation, listed as "18 Mpixel 4.3-in. 1443-ppi 120-Hz OLED Display for Wide-Field-of-View High-Acuity Head-Mounted Displays", suggests that the screen will also support a 120Hz refresh rate. It is said that in VR, anything below 90Hz or 90fps can cause nausea due to motion sickness, so 120Hz is fit for a smooth experience. That would be impressive, as currently it's been difficult to get a refresh rate as high as that on an OLED panel, with the less punchy LCDs capable of handing it much better. The screen, with 16:9 aspect ratio, could boast a resolution of around 5,657 x 3,182 per eye. For rendering such high-resolutions at 90Hz or more, there must be an extremely high-powered PC to handle the process. 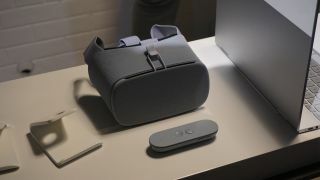 To take off some burden from the PC, Google is working on an eye-tracking method called foveated rendering, according to Google VP of AR/VR, Clay Bavor. Foveated rendering uses eye-tracking hardware to track a user's focal point, saving power by not rendering the visuals that exist outside the wearer's peripheral vision. At last year's Display Week, Bavor said Google wanted more pixels and that they'd teamed up with "one of the leading OLED manufacturers" to create a VR-capable OLED display. The manufacturer is most likely LG in this case, as Google's presentation at Display Week lists Sang Jung, Joon Yang, Soo Yoon, and In Kang from LG Display for the session alongside Google's representatives.